Jul 25 What Will Bring You Back to Ross-Ade? It has not been entirely lost on Purdue often-times thick-headed athletic department that getting fans to pile into Ross-Ade may be a daunting task this fall. It became evident during Danny Hope’s tenure that it simply wasn’t enough to have 4-6 wins each year and to beat up on the occasional patsy. Darrell Hazell immediately injected some optimism into a fanbase that was desperate for it – look no further than the terrific sendoff the team got in Indianapolis prior to their first game of last season at Cincinnati. I believe it was stated on our podcast that there hadn’t been a first game of the season so critical to a season’s outlook as that game. And as we all know, Purdue laid a big egg there – a sign of things to come. The air came out of the balloon even quicker than even the most pessimistic Purdue fan could have expected. 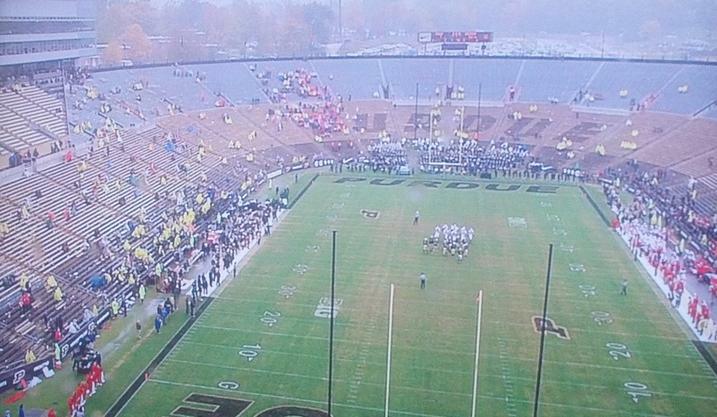 Before long, the Boilers were getting trounced at home in front of a barely half-full Ross-Ade. Fans were speaking out and if they weren’t speaking out they were speaking with their wallets – this was not acceptable and they weren’t going to trek to God’s country to watch something so frustratingly hapless. For 2014, the south end zone stands are being renovated into a party zone of sorts. Purdue will be the second Big Ten team to serve beer, although I’m not sure why that’s being reported as noteworthy since the Shively Club seats have served alcohol for a while. As for Purdue being an early adopter of serving alcohol at their games, well, insert your own joke here. On July 4, Purdue ran a promotion where the high temperature in West Lafayette for the day would be the price for a season ticket in the North End Zone. The high for the day was only 79, so between July 7 and July 11, fans could purchase a season ticket for $79. Kind of hard to top, I’ll admit, if you have even a passing interest in seeing some Purdue football in person this season. Though, as a reader of ours pointed out, what about loyal ticketholders who had already renewed their North End Zone season tickets at the regular price of $175? Uhhhh. Anyway, the point is, Purdue is clearly aware that they need to make it interesting and inviting for fans to enter the gates of R-A. And I guess my question is this: What would bring you back? Are these kinds of outreach enough? Or do you need to see a win? Several wins? A good season? Much as last season’s fan interest level hinged on the start against Cinci, this season’s early schedule is critical. If Purdue comes out and barely beats the directional schools on the docket in the first month, then I think it’ll be an empty building come conference season. However, if Purdue comes out of the gate on Labor Day weekend and pasted Western Michigan something like 45-17 or something, well, I think you’ll immediately generate some buzz. You start (the very possible) 3-1 with a decent showing in Indy against Notre Dame and you’ll have a good chunk of the fans back. Or at least that’s what I think is possible. I don’t know for sure. I do know that many of you have seemed more genuinely bothered by the direction of the program over the past couple of seasons than we’ve seen in the past. And yet, there are those who either preach patience or who are optimistic that with a new season comes renewed hope. As I outlined above, there are scenarios where I could see suddenly having hope of a step forward in 2014. Hell, Travis has outlined how he thinks Purdue can make a bowl game! I know that unless the product on the field doesn’t at least show progress, Ross-Ade will be embarrassingly empty. While that’s not good for recruiting, I realize, it may be something that needs to happen. I don’t just want 4-6 wins a year in perpetuity – I want genuine culture change. It’s something I still (perhaps foolishly) believe can happen. And it’s change that I think Darrell Hazell and much of this coaching staff can effect. If you’re a student, I still feel that you need to go to the games. You’re only in college for a short time and the stadium is right there. What else are you doing at noon on Saturdays? Those start times fit in nicely between breakfast club bar-going and evening bar-going and even leaves time for a nap. But for the rest of us… the alums, those of us far-flung around the country who have to drop some significant coin ($79 season ticket or not) to attend… what will make us come back at this point? Jul 29 "We're not good enough to miss that stuff"